Heads up if you’re heading home to Arlington via the Key Bridge tonight — a vehicle fire has closed both lanes heading out of D.C.
D.C. police say some traffic is still flowing into the city, but are otherwise warning of big back-ups heading toward Rosslyn. Police added that the fire has been put out. No word yet on when the lanes will reopen. A decades-long effort to build a boathouse along the banks of the Potomac River is lurching forward once more. Officials with the National Park Service have wrapped up an environmental analysis of the project and settled on a preferred alternative near Rosslyn for its construction, in the latest bit of forward momentum for an initiative that has long bedeviled county leaders. Local high schoolers have been particularly keen on seeing a new boathouse come to the fruition, as the closest access points for rowing teams have long been in Georgetown or Alexandria, but the project’s complexity has repeatedly stalled it. NPS took control of Arlington’s portion of the Potomac shoreline after the construction of the GW Parkway, and the federal agency has spent years working off-and-on with the county to find a way to give local rowers easier access to the river. 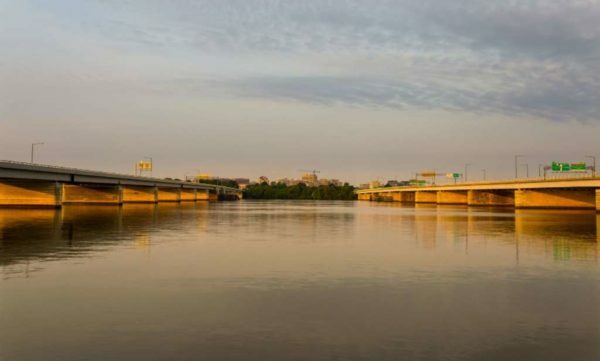 Arlington officials helped jump-start the process in 2014 by buying a parcel of land along Lee Highway just south of the Key Bridge, giving the NPS some added flexibility as it evaluated several options where the boathouse could be built. 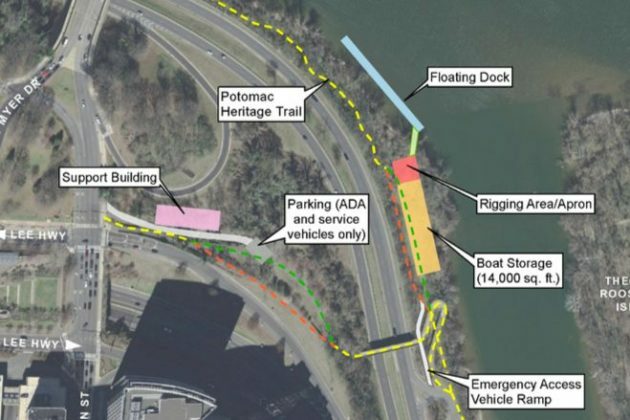 Now, the agency is recommending a design that would involve building a 300-foot-long floating dock and 14,000 square feet of boat storage along the Potomac’s shoreline near Rosslyn, just across from Theodore Roosevelt Island. The plan also calls for building a support facility on the county-owned Lee Highway site with office space, locker rooms and handicapped parking. NPS also evaluated plans to build the boathouse on the same site near the island without the support building, as well as an option that would involve building the boathouse on Gravelly Point near Reagan National Airport instead. Yet the agency settled on its preferred alternative because the additional space off Lee Highway “allows for development of a smaller boat storage structure while providing additional support facilities outside the floodplain, off NPS property, and close to transit,” officials wrote in the environmental analysis. They also noted that the Potomac is a bit calmer near the Rosslyn location, earning it higher marks than Gravelly Point. The close proximity of the Rosslyn Metro station and several local bus stops, in addition to the Custis bike trail, also won the option some praise. While the agency found that any construction would have some limited impacts on the area’s wetlands and soil, it broadly didn’t foresee many stumbling blocks for the project to move forward. Nevertheless, any construction will require both federal and state permits to advance, and the county will need to work with federal officials to find funding for the effort. In the meantime, however, NPS is accepting comments on the environmental analysis through July 30 on its website. The agency also plans to hold a July 12 open house at Washington-Lee High School on the project, starting at 6 p.m.
Update at 2:10 p.m. — The incident ” has transitioned from a rescue to a recovery operation,” according to D.C. Fire, indicating that officials believe the missing worker did not survive. The barge that overturned has been secured, the fire department said. Earlier: Rescuers are searching for a worker who remains unaccounted for after a small barge overturned in the Potomac River near the Key Bridge Monday morning. 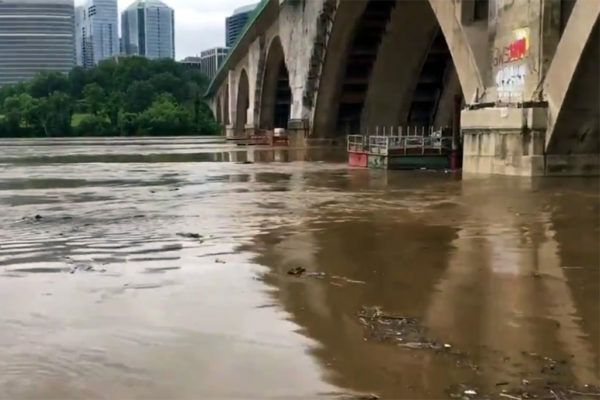 At least people were rescued after what was described as a “workboat” reportedly flipped over amid a strong current in the rain-swelled Potomac. 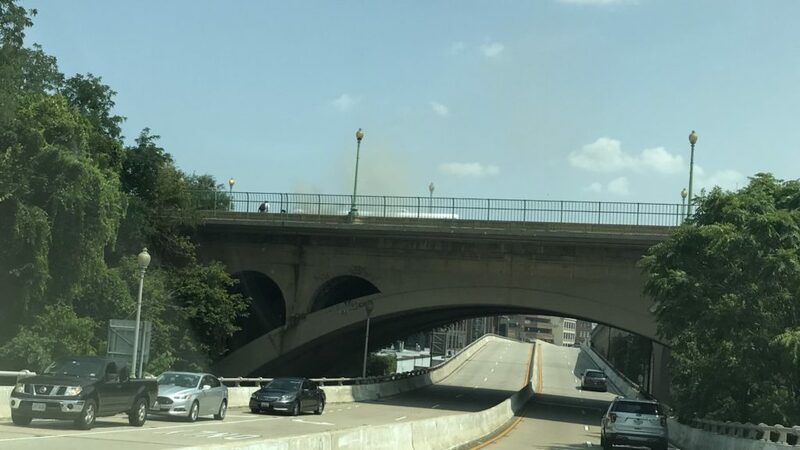 A total of six people were in the water and five made it out uninjured, according to Twitter posts from D.C. Fire and EMS. An “extensive search” remains underway, D.C. Fire said. The Key Bridge is in the midst of a $14.5 million rehabilitation project. Water Rescue Potomac River beneath Key Bridge. 3 people in water. 2 removed and 1 unaccounted for. This was reported as a workboat overturned. 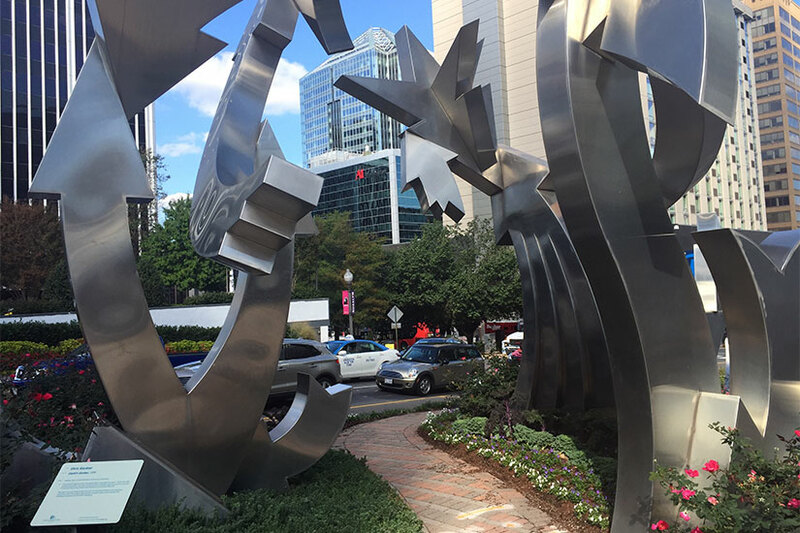 Arlington police are looking for a man who pulled a 27-year-old woman from a sidewalk and tried to touch her under her clothing in Rosslyn over the weekend. 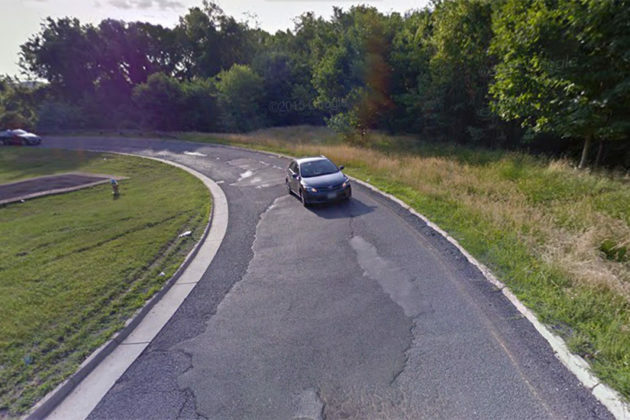 The attempted sexual assault happened in a grassy area near the George Washington Memorial Parkway and Key Bridge about 2:30 a.m. Sunday, police say. The woman and the man were walking past each other on the bridge when he grabbed her and forced her into the nearby grass, police said. The man then covered the woman’s mouth and tried to get his hands under her shorts. 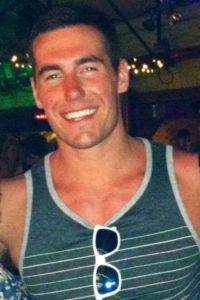 A white male, in his late 20’s to early 30’s, approximately 5’8″ to 5’10” with a medium build. He is described as having fair skin, dirty blonde hair and was clean shaven at the time of the incident. He was wearing a dark t-shirt with tan shorts or possibly pants. He was last seen fleeing the area on foot along the Key Bridge towards Washington D.C. Caps, Star Spotting at Don Tito — The Washington Capitals play their season opener Saturday, but the team has already been spotted out on the town. Members of the Caps were seen dining at Don Tito in Clarendon Wednesday night. Among those in attendance: Caps center Brooks Laich and fiancee Julianne Hough, of Dancing With the Stars fame. Starting Monday morning, commuters will have to find an alternate route to get from the GW Parkway to the Key Bridge. 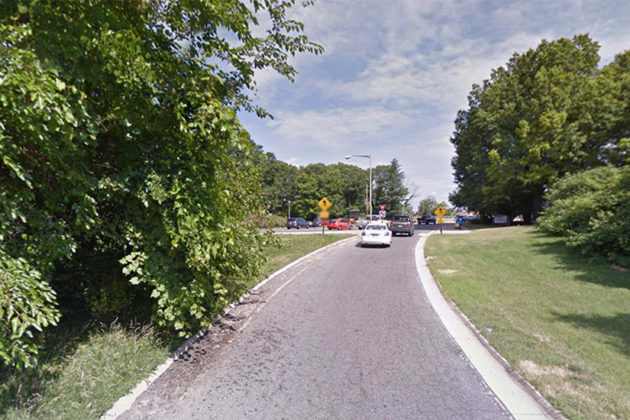 National Park Service will close the ramp from southbound GW Parkway to Key Bridge starting before rush hour Monday morning and running through Friday, Aug. 28. The ramp will reopen Saturday morning, said NPS spokesman Aaron LaRocca. NPS will be replacing the entire surface of the ramp while it is closed. The repairs include milling the road, replacing gravel and overlaying with asphalt. There will be no detours. 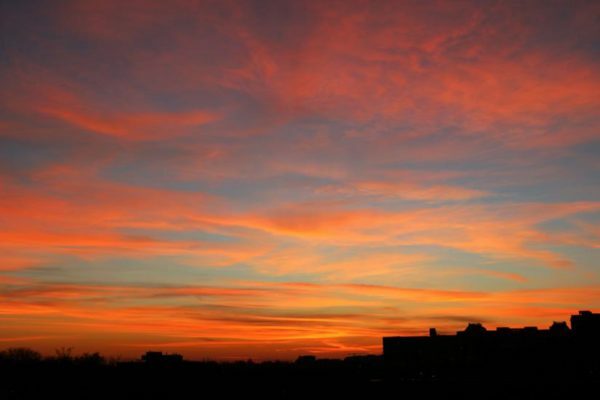 NPS advises commuters to find alternate routes and to expect delays. The driver of the SUV that crashed in the early hours of April 16 by the Key Bridge has died. The Arlington County Police Department identified the deceased as 26-year-old Jefferson R. Edwards IV, of Arlington. 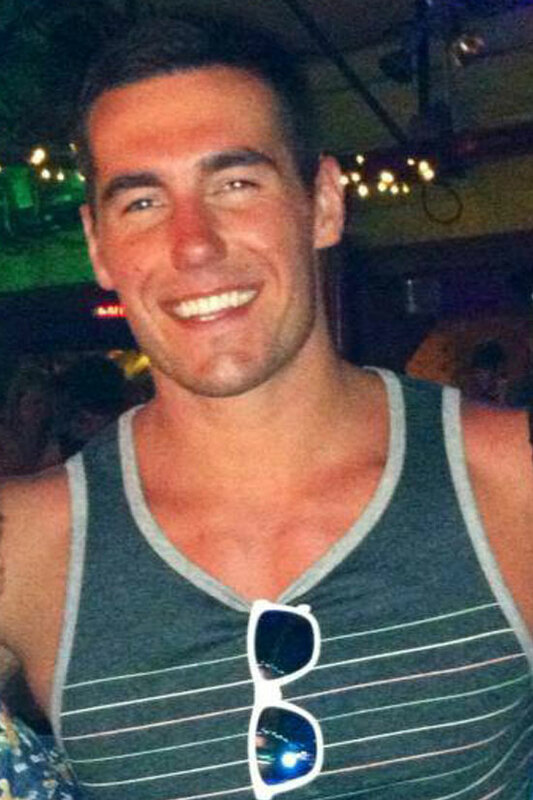 According to Edwards’ obituary, published in the Washington Post on Friday, he was 26 years old, a former member of the United States Coast Guard and had worked as a personal trainer at Fitness First and Gold’s Gym in Arlington. Edwards went by “J.R.” and grew up in Jacksonville, Fla. According to Sternbeck, alcohol and speed were factors in the crash that resulted in Edwards being ejected from his GMC Yukon at the intersection of Ft. Myer Drive and Lee Highway. He was taken to George Washington Hospital, where he remained in critical condition for at least a day before he succumbed to his injuries. Cars and bicyclists fight for space at Lee Highway and N. Lynn Street. 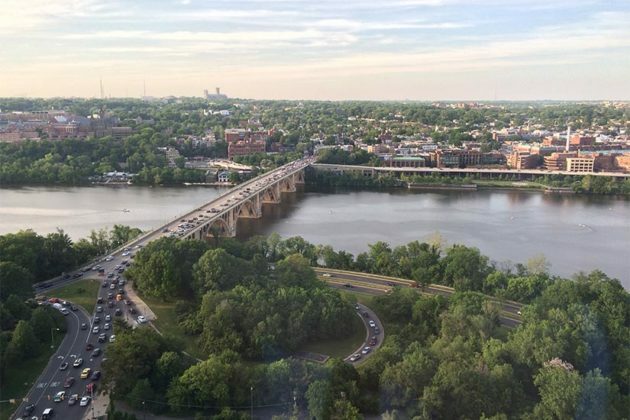 The Rosslyn intersection where cyclists and pedestrians face drivers exiting I-66 has received safety modifications in the past two weeks and more changes are on the way, county officials said on a tour of the site Tuesday morning. In advance of a $5 million overhaul slated to be complete in summer 2016, Arlington County and the Virginia Department of Transportation changed the timing of the traffic lights and walk signals at Lee Highway and N. Lynn Street last week, said Larry Marcus, the county’s head of transportation engineering. One change is minor in cost but should be significant in impact: A no-turn-on-red sign is being installed at N. Lynn Street for those exiting I-66. That’s being done “as soon as possible,” Marcus said. 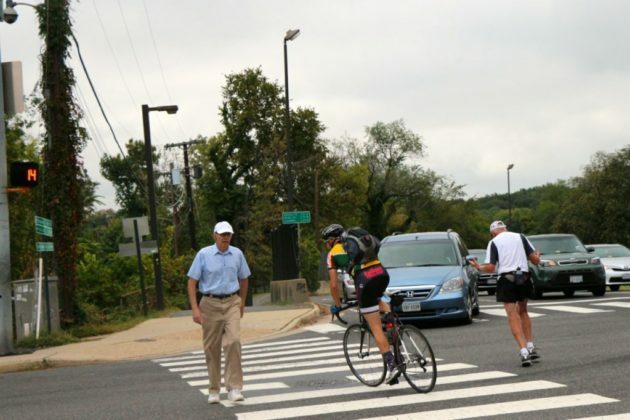 Additionally, cyclists and pedestrians crossing N. Lynn Street using the Custis Trail previously had a walk signal when all traffic lights were red — known as a “leading interval” — for just 2 seconds; the length of that signal was increased last week to 5 seconds, Marcus said. The county plans to increase the leading interval time to 15 to 20 seconds in the next six months, once new signal technology is installed. “We’re giving more time for pedestrians and bikes to go first,” Marcus said, adding that new caution signs for drivers, pedestrians and cyclists will be added to the intersection. Drivers headed west on Lee Highway, meanwhile, now have an additional 10 seconds of biker- and pedestrian-free time to clear the intersection. 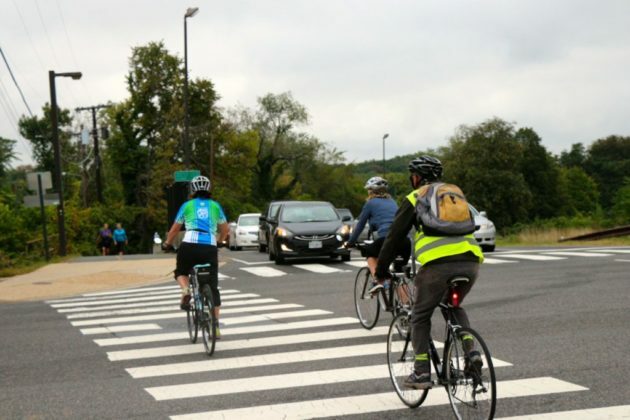 To pair with engineering changes, the Arlington County Police Department has ramped up traffic enforcement and educational efforts at the corner where numerous car-on-bike accidents have occurred, Capt. James Wasem said. “People can expect to see uniformed police officers out here flagging cars over, directing traffic, handing out some brochures and citing violations,” he said about the measures enacted about two weeks ago. Police issued 228 citations at the intersection from Sept. 15, 2013 through the same date this year: 133 for failure to obey traffic signals, 32 for improper turning and 1 for failure to yield to a pedestrian. Fifteen car crashes occurred at the intersection within that period, police said; just two crashes on record involved pedestrians. The ACPD assigns an officer to direct traffic at the intersection on weekdays from 7:00 to 9:00 a.m. but must spread officers between that corner, schools and other frequent crash sites. 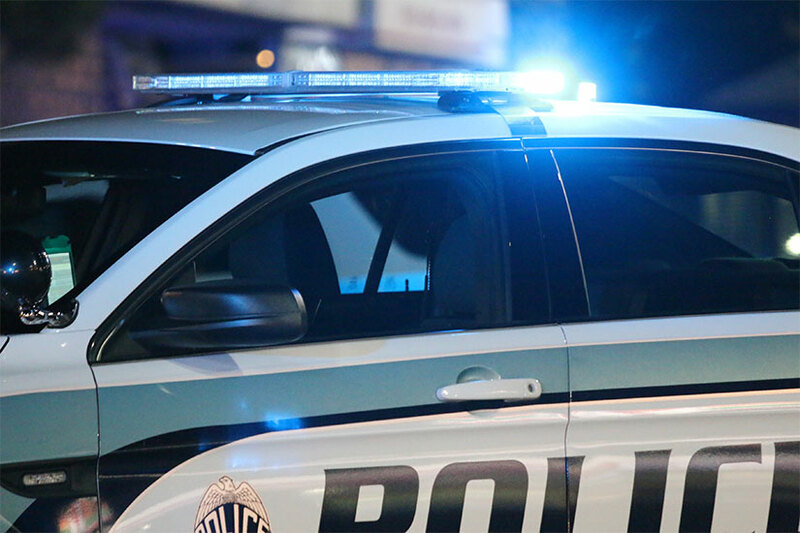 The department began sending an officer to the location “as often as possible” following recommendations from a traffic analyst the county hired this year, Wasem said. 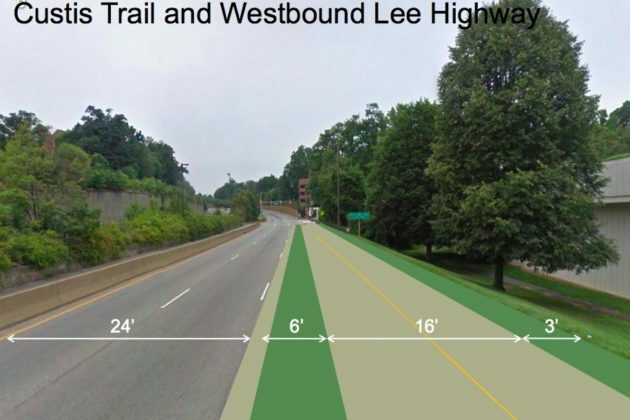 ACPD is seeking funding to assign two officers to Lee Highway and N. Lynn Street every weekday morning, plus an additional two officers at Lynn Street and Wilson Boulevard, Wasem said. 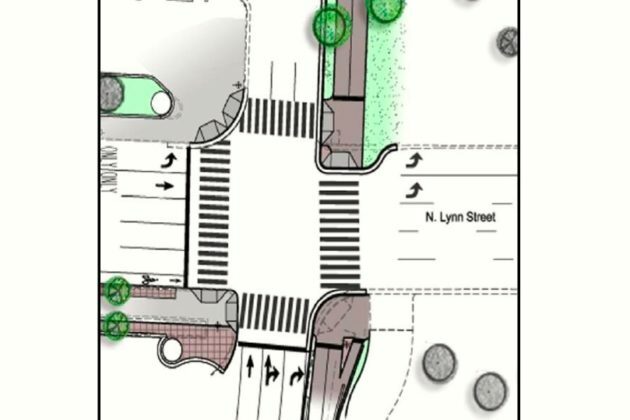 The latter intersection has been facing a chronic problem of drivers “blocking the box” during rush hour since construction began on the Central Place project, blocking lanes of Lynn Street. The additional staffing would cost $180,000 through next year. 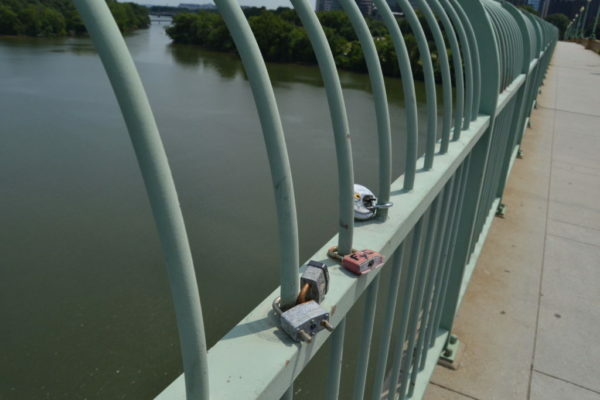 The D.C. Department of Transportation has removed the dozens of “love locks” that started popping up on the Key Bridge this year. ARLnow.com first reported the plan to remove the locks last week. The locks — padlocks with the names or initials of couples written on them — are put there to commemorate relationships, and the trend has been popping up on bridges around the world. 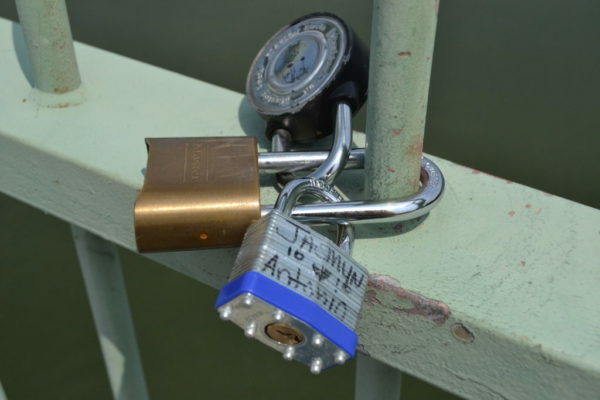 On Paris’ Pont des Arts bridge, thousands of couples attached locks to the bridge’s fencing, much like more than 50 couples did on the Key Bridge. The fencing collapsed in June under the weight. Sanders said he’s unsure of how the locks were removed, and was also unable to say if locks have popped up on any other bridge in the city. DDOT officials will inspect other bridges for locks in the coming weeks, Sanders said.